I really am pleased with this bottle. It's looks beautiful in my frig and keeps my filtered water cold. The shape is not only pleasing to the eye it's functional. Easy to hold and pour and fits perfectly on the shelf. It would indeed make a lovely vase too. My only little wish is that it had a cork to place in the opening when I'm using it for holding liquids. I purchased the green color and love it. I think any of the colors would be a good choice. A real winner!! I've had a pitcher just like this for years; it was originally my grandmother's. I usually use it as a vase. It sits in a sunny window in my kitchen, so I enjoy it every day. 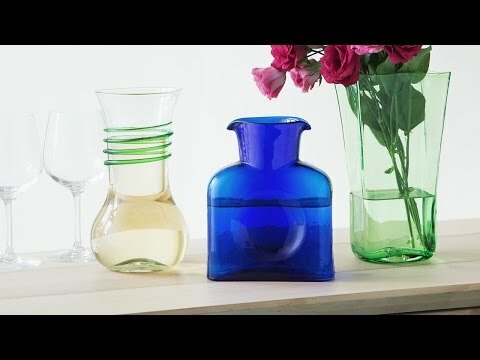 I purchased the cobalt blue pitcher as a wedding present for my niece. I'm sure she'll love it too! The double spouted pitchers are BEAUTIFUL as well as easy to use! The indentation in the center allows even arthritic hands to grip with certainty. My only complaint is the picture shows 3 colours:light blue, green and cobalt. I purchased clear and cobalt and would LOVE to buy the light blue!! The beautiful pitcher was a gift for my wife, and she absolutely loved it. It arrived in just 2 days and was in perfect condition. Thank you Grommet for great gifting opportunities. I bought this for a gift. My son in law loves Cobalt blue. I do too so this pitcher really caught my eye. It arrived in perfect condition & the color is vibrant. I can hardly wait to give it to them (he & my daughter) for a house warming gift. It is just the right size for serving refreshments & will look wonderful on the table. Love it! 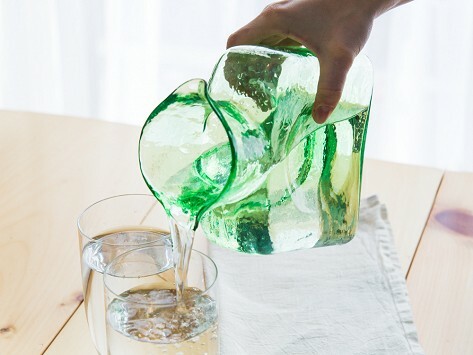 Love the green pitcher, easy to grip, purchased for myself, will be used often. I finally got one for myself! I’ve been giving these artistic and functional pitchers as gifts to others who have all given me great feedback. I decided it was time for me to have one of my own and I’m so happy I got it. It’s beautiful and looks so nice sitting on a festival dinner table.